Fire in a Truck = Bad, Call 9-11 & Run for Cover. I may have found an exception to the rule, Fire in a truck = Bad, unless fire is contained in a brick oven in a food truck named PazzaRella. Neapolitan pizza has taken root in Vancouver and for me it almost seems passé, still yummy and my preference for pizza but very 2011. 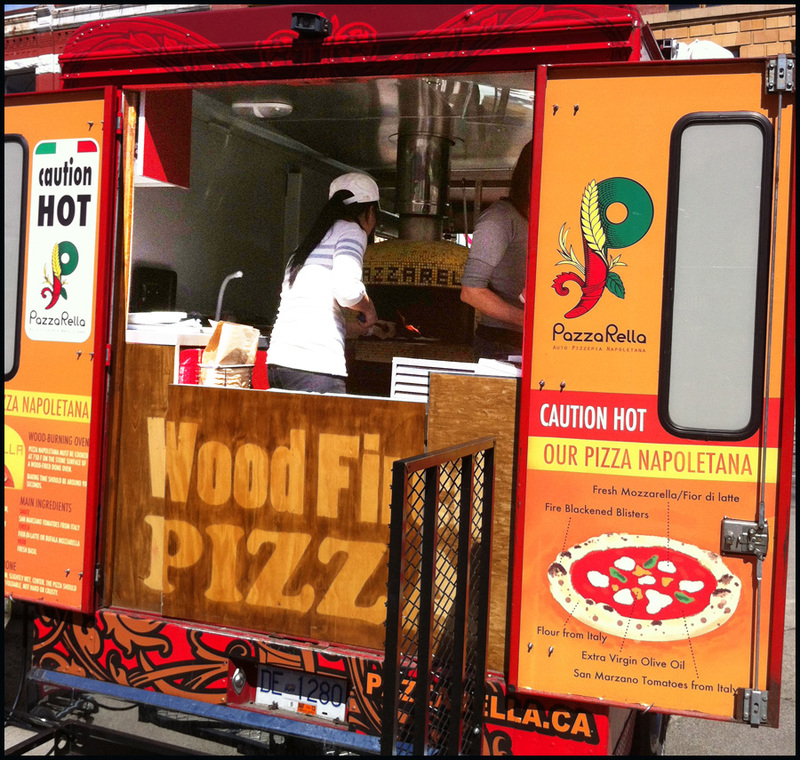 It didn’t surprise me that if there was going to be a food truck that served freshly made pizza, it would have to be the trendy Neapolitan pizza. The reason I prefer Neapolitan pizza is its lightness. I like its thinness, use of minimal ingredients and that it is cooked quickly (in and out of super heated oven in 90 seconds or less). It doesn’t sit in a greased (heavily in some cases) pizza pan like North American pizza (ie Pizza Hut) which makes me feel sluggish for hours after consumption. When cooked perfectly and paired with good quality ingredients, this style of pizza is healthy but still very flavourful. 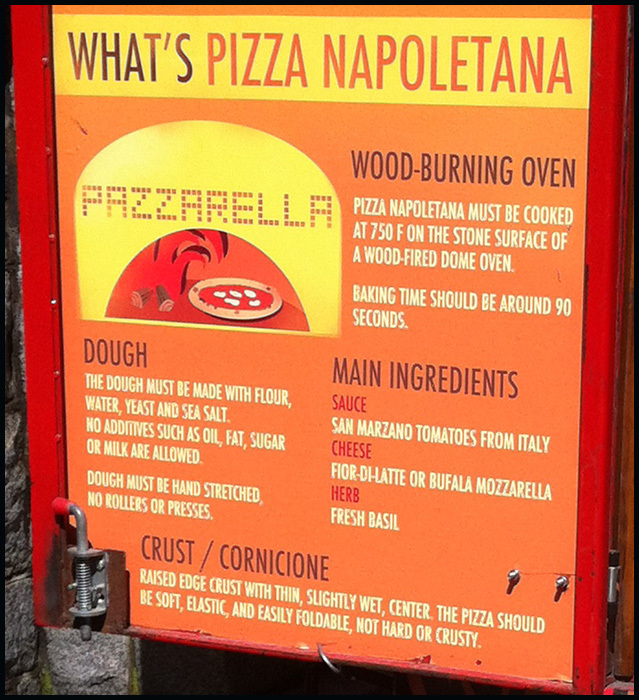 For more information about Neapolitan pizza, check out the educational content on the back door of the PazzaRella truck below. My PazzaRella yielded two “Wow” moments; one regarding their special Bacon and Egg pizza and the second moment help reinforce how powerful food can be. I think I can safely assumed that most of us have had left over pizza for breakfast, whether stone cold from the fridge or gently warmed in the microwave. How about a pizza that’s actually a perfect fit for breakfast or brunch in my humble opinion? 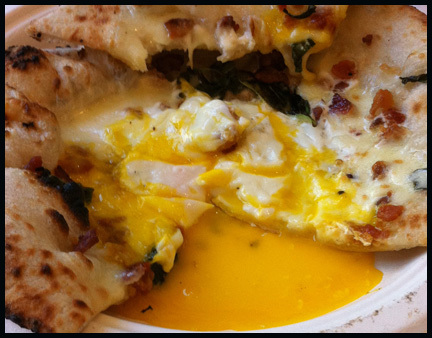 PazzaRella was serving a special Bacon & Egg pizza from Victory Square (Cambie & Hastings Streets) the day I showed up. It’s definitely more novelty than traditional but I’m always up for trying new things.. As all Neapolitan pizzas should, my pie had the spot charring or leopard spots. It was soft in the centre, but the crust was a touch chewy and a little denser than other versions I have had. However, the dough was seasoned and not bland. The toppings was what made me think, “This is so awesome!” The bacon was salty. The mozzarella was creamy but clean tasting and reminded me of a good burrata. However the star of the show was the egg. Situated in the centre, the egg was soft cooked so that when you took your first slice, a golden river of yolk streamed out and served as a perfect dipping sauce for the crust. The execution and how the ingredients worked well together was what made this pizza great. On a whim, I also order a Salumi pizza to take back to my office to share with my co-workers. The pizza was prepared well. The tomato sauce was tangy. There were thin slices of sweet onion and the salumi was of good quality. 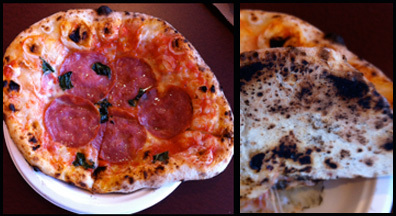 However, I think the combination of the salted dough and salumi made the pizza just a tad salty for my liking. Now here’s where the second wow moment comes in. I have a colleague who is not very adventurous in terms of trying new foods. So upon her first few bites of the Salumi pizza, her eyes lit up and she exclaimed, “This is sooo good! I think this is the best pizza I have ever had!” The happiness on her face brought a big smile on mine. This simple salumi pizza was a catalyst for 10 minute conversation amonst my co-workers about Neapolitan pizza and pizza in general in Vancouver. This experience reminded me how food can serve as a unifier, bring people together and create positive communal experiences. Food can be much more meaningful than a simple consumption item. The look of joy on my cohort’s face was something memorable. Lastly I want to say I have great respect for the dedication the two ladies working the Pazzarella truck have for Neapolitan Pizza. According to my dad, one of the most brutal aspects of working in a kitchen is dealing with the heat that comes with cooking, especially during the summer and when a kitchen is not well ventilated. I can’t imagine working in a confined space like a food truck with a super heated brick oven is comfortable. My hat goes off to those ladies. Since PazzaRella is food truck, here’s their facebook page and twitter account so you can better keep track of its location and menu offerings.